Your community could have a brand new arena up and running in just weeks. The town of Southend in Northern Saskatchewan has produced a number of Junior ‘A’ hockey players over the years that have played in both the SJHL and MJHL. 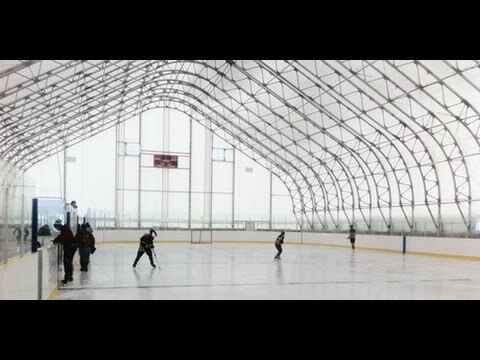 An 18,000 square foot arena is now a gathering place for the community and a practice facility for future hockey stars. The arena was up and running in just 3 weeks and it’s busy. Really busy. It’s open from 7am to 11pm and abuzz with activities from public skating to team hockey practices. The community has plans to make full use of the arena year round and is looking forward to ball hockey and special events all summer long. The team of experts at Norseman Structures can get your community inside a new arena this coming season. We coordinate all the details to bring your arena project together seamlessly. We’d love to come to your community to talk with you about this possibility. Or, we welcome you to come tour our manufacturing facility and meet our team. Either way, lunch is on us. We can’t wait to get started on an arena for your community. Please drop us a note and we'll be in touch soon.